Lindi here!! Hello December, right? I can’t believe another year has gone by. And 2016, like every other year, has had its challenges. But it’s had amazing moments as well. And, when I post next month, I’ll be a year older! Jan 4th is my birthday. And I love birthdays. Here we are when she was pregnant with her son, who was born on December 31st. So, first contest today—anyone with a December birthday, let me know and you’ll be in a drawing for a$10.00 Amazon gift card! Happy birthday to all December birthdays–you guys share the month and I hope your special day doesn’t get lost! My dad has cancer and has been going through chemo all year. It’s been tough, but he’s amazing and has gone through it all without complaint. I’m thankful he is still here and I’m treasuring every minute I have with him. Again, I can’t believe another year is just around the corner. I recently heard her speak and oh, man, she is a powerhouse of love for Jesus! Thank you for trusting us with your joys and not-so-joys. We are all in this life together, lifting one another up when and where we can. December birthdays are the best! Although my birthday is in April, 18 years ago this coming Christmas day, I was in the hospital giving birth to my firstborn, Sadie Rose. It was the best Christmas present ever! My daughter loves sharing her birthday with Christmas and my husband and I love having such an amazing daughter with a heart for the Lord. Happy Birthday December people and Lindi for January:) Agree, this year has flown by and been a big one. Ups- my youngest son started school and had the best teacher and LOVED school, I went back to work full time, meeting and becoming good friends with a beautiful family who moved here at the start of the year, an amazing group of year 12 (senior) students, good mate coming through chemo with the all clear…lots! Downs: my oldest son’s hearing issues (just discovered unilateral deafness), having to put my Masters study on hold…I’m sure there are lots more, but well and truly balanced out by the highs and the continued grace and mercy of God. I love your testimony of God’s grace and mercy! Merry Christmas and Happy Birthday Lindi and to all December readers! Hard to believe another year is coming to a close. Except for breaking my wrist in April, this year even though busy as been rather uneventful. Thankful to be close to family, so as retirees we can enjoy spending time with our three sons, their wives, and our wonderful three grandkids. Best wishes. What a beautiful picture of you and your daughter. I’m so sorry to hear about your father. I’ll keep him in my prayers. It’s so difficult to watch our parents age. This year, I’ve struggled with my mother’s dementia diagnosis, but I thank God that aside from that, she’s still healthy. Jill–thank you. :) It is difficult. To go from bowling on a team with your dad every week for 15+ years to watching him barely able to get out of a chair at times. But he’s still my dad, strong in my mind and heart. I’ll keep your mom in my prayers as well. I know that is a hard diagnosis. Dementia is The Worst. I’m so sorry. Thank you Lindi and Val. The hardest is watching what it’s doing to my father…he loves her so. Jill–I know what you mean. People keep asking me how my stepmom is doing. (She’s totally taking amazing care of my dad.) But I say I don’t know how she’s doing because she won’t let us know if she isn’t. She’s that kind of amazing. But I make sure to keep an eye on her–she needs care too, like your dad does, I”m sure. Yes, I’m putting kids and grandkids in the drawing–:) and how funny about the Christmas paper wrapping. I probably did that when mine was younger. Ha! Now we just give a card with some $ in it. But, I did buy my daughter the same birthday card 2 years in a row—she remembered, I didn’t. And yes, cancer is probably a part of everyone’s life in some way. Jenni—Whoot!! Happy birthday to you–and your Mom!! Love this! And how great it is you don’t have to work on that day. That is a present in itself, right? Thanks for commenting! Happy birthday and Merry Christmas to all the December babies! This year has been full of highs and lows…publishing in a novella collection, back surgery, new writing opportunities, losing a dear friend. In short, life happened, but the Lord has taught me I never need be afraid no matter what waits around the next bend. The joy of the Lord is our strength. May the Lord bless every moment of this holiday season. The loss of your friend (our mutual friend) hit many of us. You are so right, though, that it doesn’t diminish the strength we draw from the joy of the Lord. Blessings. Happy birthday in advance and Merry Christmas. I know a few December babies, but my family got the memo a bit delay and many of us were born January (grandma, uncle, 2 cousins, and me). It’s a lovely time to celebrate. I find it quite interesting how our family ended up celebrating most birthdays in few months throughout the year (January, March, June, October, and November). Even my husband’s family birthdays are in the same months, so we have many gatherings in just a few months every year. It makes for busy months (I’d rather sometimes have them more spread around), but still I love birthdays. Speaking of which, I’m really excited for Christ’s birthday this year (I love Christmas, right up there with Easter are my favorite times of the year). It was a difficult year professionally for both me and my husband, but we’re hanging in there. We’re trying to forget all the down side and think about our little one that is coming to join our family this February (new month!). It’s been the best coping mechanism for sure. Our family seems to tend to lumped birthdays, too. Most of my hubby’s nieces and nephews were born in July and August. In our own family, our son’s February birthday was joined, years later, by our son-in-law’s Feb birthday. My daughter and son-in-law’s two daughters were born in February (2010 and 2012) and a new baby is due to them… this February! What are the odds?!?!?! Valerie–that’s crazy!! All these birthdays in the same month. It”s weird how that happens. :) February rocks, though–that’s my hubby’s birthday month. Priscila—I too have Easter as my fav holiday–Christmas right behind it–they go together for sure!! We do the same things with birthdays—our months are Nov, Dec Jan, Feb and Sept—we have one lone bday in May–that’s with our kids and their hubbys–and all of our kids got married within 5 weeks—Beginning of August to Sept 10th—so, that is awesome–easy to remember. Congrats on the new additions–I know joy will come with that–I’m sorry about the job issues–but God. He sees that big picture like I mentioned earlier. Love! Happy birthday to all the December babies! And Lindi, praying for you and your Dad. 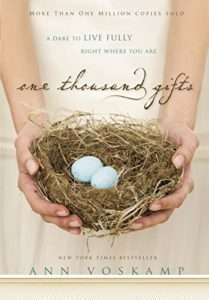 I love 1000 Gifts, so awesome to be reminded to focus on gratitude! Autumn–Hi!! Thanks for praying. 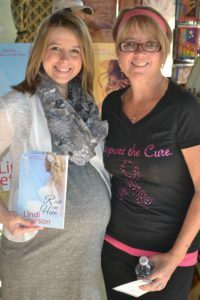 :) And that Ann Voskamp–whoa–she is amazing. You share a birthday with my daughter! She will be 14. My friend was born on Christmas and she likes it. Merry Christmas! Prayers for your family. I love that book and the praise it encourages. Thank your for sharing. Janet–thank you for praying. And yes, the 1000 gifts book. :) so awesome. My youngest son was born in December! This year, I’ve learned to lay down my dreams at the feet of Jesus and leave them there. Trust is being built up better than ever, and I’m so grateful for God’s patient work in my heart. This has really been a tough year for our family. We lost our oldest daughter, at age 41 (my stepdaughter) in February due to an extended illness. Six months later we lost her daughter at age 26 in a car accident. Her birthday by the way was December 28. And my 93 yr old father in law has been in and out of the hospital numerous times with various health problems. Recently diagnosed with untreatable lung cancer, we realize this will be our last Christmas with him. Lots of stress for all of us but especially for my husband. But we cling to the Lord and pray and know that He is in control. Merry Christmas to all of you and happy birthday to all the December “babies”! Gail—OH! My heart goes out to you and your family. Loss is already hard, but to experience so much in a short time is something we can’t comprehend. And I’m sure, with as much joy as there is around this holiday season, it will be a mixed time for all of you. Especially December 28th. I’ll be praying extra hard for you on that day. Thank you for sharing with us. My dad has untreatable lung cancer as well. :( Boo-hiss cancer! But God—He is good and gracious and will pull our fragile hearts through when we cling to him–just like you and your family are doing. We won’t be the same, but we’ll settle into our new normal and keep praising Jesus! My mother-in-law, who has gone to be with the Lord, was born on Christmas, and my older granddaughter who will turn eight this week was born on December 13. She was supposed to be a Christmas baby, but she decided to come a little early. I ask myself the same question, how can it be December AGAIN? Where did 2016 go? No December birthday’s here. My daughter is a leap-year baby so she’s in February, my son in April, my grand-girl & niece in March and then my husband, myself and my sister-in-law are all in August. We’re incredibly blessed and even in times of difficulty we know God has our best interest in mind! Trixi—Thanks for stopping by. How cool about your husband’s job. :) And I’m sorry about the house hunt. It does seem to be stressful. And yes, all the pieces will fall into place.